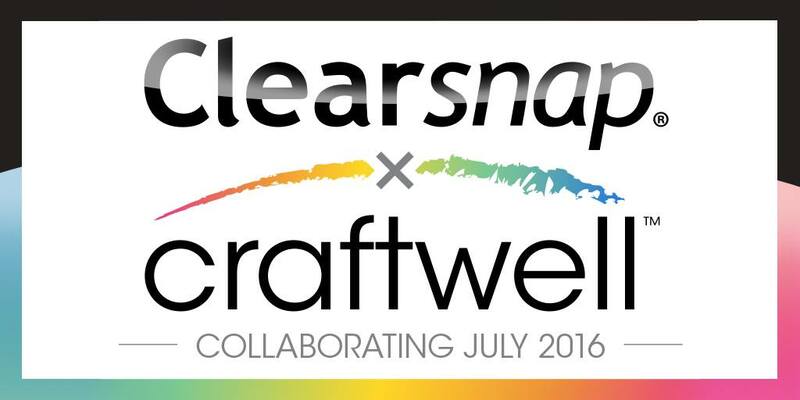 Hello and welcome to week four and final day of the Clearsnap sponsored month. This is Yolie with today's project. I used Teresa Collins' Platinum Silver pigment ink by Clearsnap world stamp. I cut out a 2.75" circle on white cardstock and stamped the image. While the pigment ink dried, I cut a 3"x3" piece of white cardstock and eBrushed the chevron stencil pattern, followed by the circle stencil. After the stamped image dried completely, I sprayed a bit of the blue mister on a plastic sheet and brushed the ink around the stamped image. Being careful not to touch the pigment ink to avoid smearing. 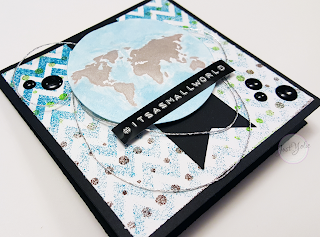 I added silver jewelry string to the back side of the world and used pop dots to adhere. 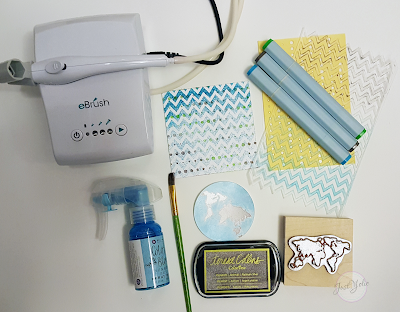 I used the label buddy for the sentiment and embellished finished the card with black enamels.